Scorpions belong to the Arachnida class, and they are related to spiders, mites, and ticks. The average size of scorpions is about 3 inches long, but other species may be smaller or larger than that. Some people have scorpions for pets, others have them as pests infesting their homes and in some cases, people get in contact with these creatures through their jobs and other activities. Regardless of how you perceive them, scorpions have venom and they have the ability to sting you. Here’s what you need to know about scorpion stings and what you need to do in case you get stung. The sting coming from a scorpion is released from the tail or stinger. The type of venom a scorpion releases is dependent on the species it belongs to. But generally, the venom is a mixture of different toxins that can affect the nervous system. There are almost 2,000 scorpion species in the world today, but only 30 or 40 of them are said to inflict stings that can cause fatal harm or effect. In the United States, the bark scorpion, which is typically dominant in the southwest regions including Arizona, has a type of venom that can have severe implications. Scorpion stings are typically harmless and the discomfort coming from being stung is usually manageable. However, there are cases when scorpion stings have adverse effects and may even result to death. Scorpions are not typically aggressive and they don’t sting every species that they come in contact with. They only sting other creatures, including humans, if they feel provoked. In fact, they can control the amount of venom they release depending on how threatened they feel they are. That’s why some scorpion stings may not be as severe as others. 1. Determine who got stung. As mentioned, scorpion stings typically don’t have adverse impact to health, and all they give off is minor discomfort and pain. However, there are cases when symptoms can be more severe, especially for young children and older people who have weak or still developing immune systems. When a child or an elder gets stung, it always pays to be risk-averse. Pay attention to the symptoms they manifest, and take them to the doctor right away. This helps prevent any severe reactions to the sting and contain the situation before it goes out of hand. Just the same, take your pet to the vet immediately when it experiences a scorpion sting. When an adult was stung, it’s advisable to observe the symptoms first. At the first sign of a severe reaction, head to the emergency room right away. But how do you differentiate a mild from a severe symptom? Let’s look into it in the next item. The body’s reaction to scorpion stings can either be mild or severe. It depends on a lot of factors such as the person’s overall health, the type of scorpion, and the amount of venom released. Severe symptoms rarely happen, but when they become evident, you need to seek medical attention immediately. 3. Know the Type of Treatment to Seek. Wash the affected area with soap and water. Take off any form of jewelry or accessory that may affect circulation when the area swells. For instance, if you get stung on your finger and you’re wearing a ring, you should take it off for the meantime. Apply cool compress directly on the sting and the surrounding area. This is advisable for the first two hours after the sting. Take pain relievers to manage the pain and discomfort. But before doing so, consult your doctor about the right type of pain medication to take to avoid any further complications. Meanwhile, if a child, an elder, or a pet was stung, seek medical attention right away, especially if they are manifesting severe symptoms. Continue to apply cold compress on the affected area on your way to the clinic or hospital. If you were stung while in a foreign country or travelling, you should seek medical attention immediately. 4. If possible, take the scorpion to the doctor. The best way to determine the right treatment for a scorpion sting is to know the type of scorpion that stung the patient. If you’re able to capture the scorpion, secure it in a container and bring it to your doctor. However, be careful when trying to catch it, and make sure that you don’t get stung in the process. 5. Prevent future scorpion stings. Scorpions are generally not aggressive unless they are provoked, but it’s important to know how to avoid their stings and how you can prevent them from inhabiting your home. If you have a scorpion as a pet, you should know how to properly handle it in order to prevent them from stinging you, your family, and your other pets. Meanwhile, if you work in an area where scorpions most likely thrive, always wear protective clothing to help prevent any form of contact between scorpions and your body. If you spot a scorpion crawling on your skin, quickly brush it away and don’t slap it. If you slap a scorpion, it may end up stinging you if you didn’t hurt it enough. There are cases when scorpions leave their outdoor habitat and enter structures like homes and buildings when they search for shelter and water. This is one of the causes of scorpion infestations, and you can avoid it through regular AZ pest inspections. More so, if there’s an on-going scorpion situation in your home, you should rely on professional pest treatments to prevent any form of injury from inflicting you and your family. 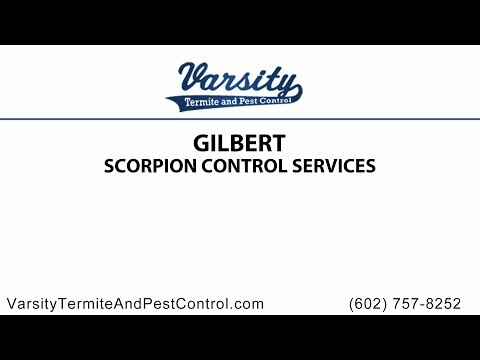 Please get in touch with us if you need any assistance in Gilbert scorpion removal or Gilbert pest infestation. Scorpion stings can range from being manageable to fatal. That’s why you need to be aware of what you need to do in case you or a loved one was stung. This handy guide can help you not only with addressing scorpion stings, but also with preventing these creatures from causing any further harm to your family and home. Contact us today!